There are some interesting researches about the Romans in Ceylon. One was done by Arianna Dimucci (Texas University) in 2015, who wrote even about the Roman presence in China. "But not even Taprobane, though consigned by nature outside the world, lacks our vices: there too gold and silver have commercial value, marble is considered similar to tortoiseshell, and pearls and gems have high prestige. Their entire mass of luxury is greater than ours." Located at the midpoint of major sea routes linking China and Southeast Asia with the Middle East and the Mediterranean, Sri Lanka served as an important “transit trading place” or linchpin between the East and West. Gems, pearls, muslins, ivory, and tortoise-shell, along with rice, ginger, honey, beryl, amethyst, gold, silver, and other metals – mentioned by Ptolemy (c. 90-168 AD) – constituted quite a few of the island’s luxury commodities that reached the Mediterranean. The discovery of an ancient shipwreck (called "Godavaya shipwreck" and that has been excavated since 2012) off Sri Lanka’s southern coast and its cargo of iron ingots, demonstrated the existence of commerce between Ceylon and possibly the Roman Empire, and prompted a discussion of the region’s various exchange networks. The Godavaya shipwreck, dated to between the second century B.C.E. and the first century C.E., merits attention for a number of reasons: 1) it is likely the oldest sunken cargo in the Indian Ocean, 2) it provides direct evidence for Indian Ocean trade and 3) it represents one of the most promising opportunities to study the iron trade in this region. One of the best resources available to examine such a shipwreck is the well-known work, the "Periplus Maris Erythraei", a text thought to have been written by an un-named Romano-Greek merchant from Egypt between the first and third centuries C.E. Less frequently considered Chinese texts like the "Hou Han-Shou", written between the second century B.C.E. and the second century C.E., and "The Sea Route from Guangzhou to Countries in the Indian Ocean", a late Tang Dynasty document written in the eighth century, which underscore the island’s connection to the East, are equally relevant to a discussion of regional commerce. Additionally, we must pinpoint the recent discovery of Roman coins in southern Japan (Okinawa), that demonstrates the existence of commerce between Rome and the far east through India and Ceylon. Evidence for Indian Ocean trade is well-represented in Greek and Roman literature especially in the above-mentioned text, the "Periplus Maris Erythraei", which is considered the “most detailed and comprehensive surviving account of Roman involvement in the Eastern commerce.”Written by an un-named, Romano-greek merchant between the first and third centuries C.E., the text was likely intended as a guide for other merchants and subsequently contains a considerable amount of first hand knowledge of the trade, including information on the routes and various ports in Arabia, Africa, and India. It contains distances between locations, principal anchorage points, and lists of merchandise, making it an invaluable resource for any ancient merchant determined to undertake a commercial expedition to the Indian Ocean. Where ancient Sri Lanka is concerned, the Periplus is not well detailed. The author indicates in the text where the island was, i.e. beyond India, and calls it Palaisimundu or Taprobanê; he also writes that its northern parts were civilized and states that the island produced pearls, transparent gems, cotton garments, and tortoise shell. He additionally exaggerates the size of the island and writes that it projected west into the ocean, orienting it east-west as opposed to north-south. He is not the only ancient author to do so. Onesicritus of Astypalaea (c. 360-290 B.C.E.) a Greek commander in Alexander’s fleet whose writings were preserved by Strabo (c. 64/63 B.C.E.-24 C.E.) and by Pliny (c. 23-79 C.E.) commented on the island’s size and its distance from India.67 Strabo quoted Onesicritus as having written that Taprobanê was 5000 stadia in size and 20 days’ voyage from the mainland, though whether this journey was from the Indus delta or from the southern end of India is unclear. Pliny quoted Onesicritus as having written that Taprobanê was for a long time considered to be another world. A fragment from the Greek writer Megasthenes (c. 350-290 B.C.E. ), preserved by Pliny, described Taprobanê as richer in gold and pearls than India. Eratosthenes of Cyrene (c. 275 194 B.C.E. ), an Alexandrian scholar whose writings were also preserved by Strabo, wrote that Taprobanê was seven days’ journey south of India and measured, length-wise, about 8000 stadia in the direction of Ethiopia. Pliny credits Eratosthenes with different measurements: the island supposedly measured 7000 stadia in length and 5000 in breadth and had no cities but 700 villages. Again, the island was thought to run east-west towards Africa and its size was overestimated. Hipparchus of Bithynia (c. 190-126 B.C.E. ), whose writings were preserved in the work of the Roman geographer Pomponius Mela, commented that Taprobanê was either a very big island or the first part of another world. Strabo commented that Taprobanê, which he places in front of India, was no smaller than Britain. The size of both Britain and Taprobanê were exaggerated and both came to be thought of as possessing parallel characteristics. As the “ends of the known world” they provided symmetry, with the northern part of Britain turned eastward to hug the coast of the European mainland and the southern part of Taprobanê extended westwards towards the eastern shore of Africa. Strabo, placing Taprobanê in the real world, pinpoints the island opposite the ‘Cinnamon bearing Land,’ i.e. Somalia. Finally, Ptolemy (c. 90-168 C.E. ), though similarly misinformed about Taprobanê’s size, was much more accurate concerning its shape and its north-south orientation. According to Pliny, the Mediterranean world had known of the island’s existence since the time of Alexander the Great, but direct contact with the island did not begin until the reign of Claudius (41-54 C.E.). Young adds that there appears to have been limited or indirect contact between the Roman Empire and Sri Lanka, especially prior to the fourth century. Indeed, the Periplus implies that the strait between India and Sri Lanka was the furthest point normally reached by western vessels trading with India, due in part to the fact that Mediterranean vessels may have been too large to easily negotiate the shallow straits between India and Sri Lanka. Such Greek and Roman sources reveal that Sri Lanka was known to the Mediterranean world, partly as a distant island south of India and partly as a far-away ‘other’ – a producer of exotic goods whose inhabitants lived long lives. What sources like the Periplus Maris Erythraei make clear is that voyages across the Indian Ocean were part of established trading routes that involved both Mediterranean and Indian craft, potentially even the vessel recently discovered off Sri Lanka’s southern coast, the Godavaya shipwreck. Large ships on which high flags on mast-tops wave Spread out their sails and cleave the rolling waves, Tossed by the winds of the great dark, treble sea On which rest clouds. They come to the sound of drums To the port, their trade successful, with the gold That much increases people’s wealth. So goods flow in from sea to land, And also flow from land to sea. Unmeasured are the abundant wares Here brought and piled. Another poem denotes that merchants arrived at ‘flood time.’ Foreigners, or Yavanas, were primarily traders, but Tamil poetry also attests to their presence as craftsmen and bodyguards.86 Yavanas are mentioned drinking and wandering along the streets at night; all of which provide interesting evidence of their presence in the early centuries of the Christian era. When Gallus was prefect of Egypt, having accompanied him and ascended to Syene and the borders of Ethiopia, we found that even 120 ships were sailing from Myos Hormos to India, but under the Ptolemaic kings only a very few dared to sail and to trade in Indian goods. Long-distance trade with Arabia and India was greatly facilitated by the use of the monsoon winds, which enabled merchants trading with India to travel there directly rather than make a long and dangerous coastal voyage. Prior to this, few ships made the trip directly and cargoes were transshipped from Indian and Arab ships at one of the southern Arabian ports. The Periplus Maris Erythraei, for instance, mentions a time when there were no direct sailings from Egypt to India and all cargo was transshipped at Aden. After the discovery of the monsoon winds by Greek seamen, Mediterranean ships made the crossing directly. Vessels arrived in India in September or perhaps early October, depending on when they had initially departed. Ships left for the return voyage according to the Periplus, at the onset of the northeast monsoon in early November, though vessels could leave as late as December or January. 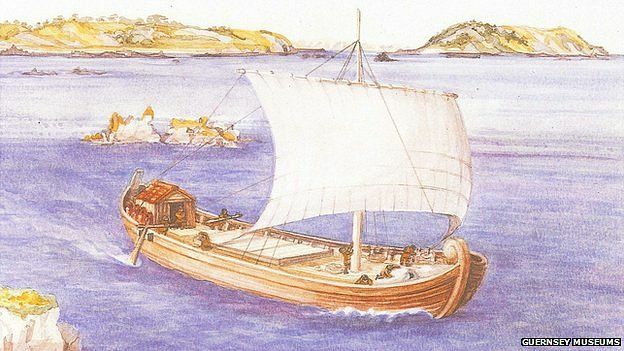 The Periplus of the Erythraean Sea, however instrumental and crucial to the study of maritime trade in this region, is not the only textual source relevant to this discussion. Chinese sailing directions in the "Hou Han-Shou" (the Historical Book of the Han Dynasty), written between the second century B.C.E. and the second century C.E., clearly attest that the country Yibuchen lay south of India. A late Tang Dynasty document written in the eighth century, The Sea Route from Guangzhou to Countries in the Indian Ocean, is more helpful in that it describes a venture from Canton to a variety of places in the Indian Ocean, including Sri Lanka, providing approximate sailing times in ‘Li’ or days. These documents help clarify the extent of Sri Lanka’s maritime connections. In India, the ports of Barbaricum (modern Karachi), Barygaza, Muziris, Korkai, Kaveripattinam and Arikamedu on the southern tip of India were the main centres of this trade with Rome. Furthermore only two visits to Sri Lanka by Romans have been officially recorded: that of a freedman of Annius Plocamus in the first century A.D., which resulted in the sending of a delegation from Sri Lanka to Rome during the reign of the emperor Claudius (A.D. 41-54) (Pliny N.H. VI.23.84), and that of Sopatros, probably in the fifth century A.D. (Cosmas Indicopleustes, Christian Topography XI.17-19). Indeed Pliny wrote that Annius Plocamus, a Roman who was related to the Emperor Claudius, sent one of his sailors to explore the seas east of Roman Egypt. The latter landed in Hipporos, a port on the southwestern coast of the island of Taprobane. He stayed there for six months, the time to learn the language and customs. He left towards Rome with four ambassadors of the island. There he said that "...the island had 500 cities. Palesimundium was the capital, a city of 200,000 inhabitants in the center of the south coast, bordered by the river of the same name, one of the two largest rivers of the island; the island was also home to Lake Mégysba, a large inland lake full of islands (home to pasture); a second great river, the Cybara, watered the North Island towards India. The island was 2000 stadia (~ 400 km) long, which corresponds to the dimensions of Ceylon. The island was rich with precious stones, marble, gold, silver, pearls ... The king was dressed like the Greeks, while his people dressed as Arabs...."
All this confirms the existence of huge trade between Rome and Taprobane since Augustus times. Furthermore Chandra Tilake Edirisuriya wrote in detail that: "Pliny relates that in the time of Claudius Caesar (41-54 CE), a freedman of Annius Plocamus, while coasting off Arabia, was carried by the winds, and after drifting for 15 days, made land at the haven of Hippuros in Taprobane, where he went ashore and was hospitably entertained by the king at the capital Paleisimundus, for six months.The freedman then returned to Rome taking with him two "Sinhala ambassadors" led by one Rachias (ratiya or ratika; a district chieftain), who were sent by the Sinhala king to establish direct commercial contacts with the Roman emperor. An inscription of Annius Plocamus recently discovered in Egypt, is dated 5 July 6 CE, in the reign of Augustus and proves Pliny to have been wrong in ascribing the story he relates to the time of Claudius. Further evidence that the Roman emperor was actually Augustus is provided by the commentary to the Mahavansa which states that King Bhathikabhaya of Sri Lanka (22 BCE-7 CE), the contemporary of Augustus, sent ambassadors to "Romanukkharattha" (or the country of the Romans) and obtained coral, a well-known product of the Mediterranean, with which he had a net ornament made for the Ruvanveliseya at Anuradhapura. Pliny purports to describe Taprobane and its inhabitants according to the accounts given by the Sinhala ambassadors, but it is evident that much of what they are supposed to have said has been misunderstood. The Periplus asserts that the name Taprobane had been replaced by 'Paleisimundu'.Direct trading between the West and Sri Lanka began towards the end of the 1st century CE and developed rapidly thereafter. The far-famed but little-known island of Taprobane became a reality to Western merchants. Numerous first-hand accounts of the island and its people and products became available through mariners to Greek and Roman geographers, and this material formed the basis of the altogether exceptional description of the island computed by Ptolemy about the middle of the 2nd century CE. Ptolemy calls Sri Lanka 'the island of Taprobane which was formerly called Simondou and now Salike' and he adds that "the inhabitants are commonly called Salai." 'Salike' and 'Salai' are from Sinhala. Ptolemy fell into the same error as other geographers in exaggerating the size of Sri Lanka to 14 times its actual area, but gives its general shape and outline with greater accuracy than the Portuguese did in the 16th century. The wealth of information which he gives shows that by the 2nd century Western traders and mariners had acquired a remarkably good knowledge of the coastal and interior topography of Sri Lanka.The Axumites had begun to monopolize the Indian sea-borne trade, by the 4th century and the Romans used them as middle-men. Roman commerce with the East was revived by Emperor Constantine and in the year 362 CE an embassy from Serendivi or Sri Lanka was received by Emperor Julian. The Arabian form, Serendib, of the name of Sri Lanka, had already gained currency in the West. Sri Lanka had become the entrepot of sea trade between the Near East, India and the Far East, by the 6th century. Persian and Axumite ships from the West, Chinese and South-East Asian ships from the East and the shipping of India met in the harbours of Sri Lanka, principally Mahatittha, now Mannar, and exchanged their merchandize as well as purchased the products of Sri Lanka. Great wealth accrued to the Sinhala kings. The trade contacts with the Western world, thus inaugurated, continued during the subsequent centuries up to the fall of the Roman Empire in 476 CE, as indicated by the discovery of large hoards of Roman coins at various places in the island." Roman coins and contemporary local imitations of Roman coins were in wide circulation in Ceylon/Taprobane for a period of at least four centuries, starting in the third century CE and until the seventh century (during byzantine times). Taprobane was situated on the maritime trade routes between Rome and China and traded many commodities such as jewels, pearls, camphorwood, spices and ebony with the Romans over this long period. The Roman historian Pliny the Elder recorded that four ambassadors of Taprobane were sent to Rome during the reign of King Chandhrakuma Siva (44-52 AD) and it is probable that some trade commenced at that time. Large hoards of copper or bronze Roman coins and contemporary Indo-roman imitations have been found at many places in Lanka with a large hoard being found in 1987 at Sigiriya. The coins are always very worn indicating a wide and constant circulation and the roman coins are usually third century and later in age. These hoards suggest that the roman and indo-roman coinage was probably used as small change long after the minting date of the coins themselves. Occasional gold trade coins from Rome are also found in Taprobane, like a Byzantine Roman solidus of Heraclius and Heraclius Constantine (610-641 AD). Roman traders typically used coin to acquire such exotic eastern goods though gemstones, fabrics, corals, and mineral powders such as antimony, sulfide, and yellow orpiment were also traded. Large quantities of raw materials including glass, copper, tin, and lead were also in demand in Sri Lanka. Additionally, iron is mentioned in Pliny’s Natural History as well as in the Periplus of the Erythraean Sea where ‘Indian iron and steel’ are specifically denoted. The Periplus specifies that in Barbarikon, a port on India’s northwest coast, traders could purchase costus (used as a medicine), bdellium, lykion, nard (a medicinal unguent occasionally used in cooking), turquoise, lapis lazuli, silk, cloth, yarn, and indigo clothing. These items could be purchased by Western merchants or exchanged for printed fabric, multicolored textiles, peridot, coral, storax (a resin used in medicines), perfumes, frankincense, glassware, silverware, and wine. Roman money – written in the Periplus as δηνάριον (denarii) – could be exchanged in the port for local currency at a profit. Following India’s coastline south to Barygaza, a port and industrial center, the author of the Periplus indicates that there was a market for foreign wine, metals (including copper, tin, and lead), coral, peridot, cloth, storax, yellow sweet clover, raw glass, realgar, sulfide of antimony (used primarily for the eyes, both as a cure for sores and as a cosmetic applied to the lids and lashes), and gold and silver currency. Barygaza exported nard, costus, bdellium, ivory, onyx, agate, lykion, cloth, silk, yarn, long pepper, among other items brought from nearby ports. Further south, Muziris and Nelkynda were markets for peridot, multicolored textiles, sulfide of antimony, coral, raw glass, copper, tin, lead, wine, realgar, orpiment, grain, and a ‘great amount of money’. Lionel Casson comments that ‘money,’ or Roman coinage, was emphasized in the Periplus in reference to these two ports to underscore the necessity of having silver and gold currency to purchase goods at Muziris and Nelkynda; elsewhere bartering seems just as prominent a strategy. Muziris and Nelkynda exported pepper, fine-quality pearls, ivory, Chinese silk, Gangetic nard, malabathron – a kind of cinnamon from trees in northeastern India – as well as a variety of transparent gems, diamonds, sapphires, and tortoise shell. While the author rarely comments on the volume of the trade with India, he does write at one point that the vessels departing Muziris and Nelkynda carry full loads due to the quantity of pepper and malabathron they pick up at these two ports. Pliny, whose figures owe more to Stoic moralizing on the cost of luxury than to imperial customs receipts, attests that 50 million "roman sestertii" per year were sent to India to pay for goods; elsewhere in his Natural History he claims that 100 million sestertii were spent yearly upon all the goods imported from India, China, and Arabia. Pliny also quotes prices of 4-15 denarii per pound for various types of pepper, 40-75 denarii per pound for nard leaves, and 300 denarii per pound for cinnamon. Literary complaints about eastern luxuries and corrupt ‘luxurious’ living developed alongside a steady market for such eastern goods. Propertius (c. 45-15 BC) for instance, who condemns Indian gold, Red sea pearls, Tyrian purple, and Arabian cinnamon and criticizes imported beauty aids – perfume, make-up, jewelry, hair-dye, and diaphanous garments – draws on an established ‘anti cosmetic’ tradition in his poetry. Ovid (c. 43 BC-17 AD), similarly mentions silks, decorated cotton, pearls and various gemstones, as well as other decorative materials such as shells, tortoiseshell, coral and ivory, perfumes and unguents, and writes that a ‘middle way’ should be found between neglect and over-refinement. Culinary items, including pepper, cinnamon, and cassia, for example, are also mentioned. Such goods would have been coming to Rome from the Far East, from Arabia and India, at a time contemporaneous with the Godavaya shipwreck. Gary Young, who has studied the various routes and communities involved in Roman commerce with the East, cautions against indiscriminately denoting such products as ‘luxury goods,’ or assigning the demand for such items wholly to a Roman taste for luxuria. While some goods were indeed luxury goods, many commodities had medicinal or religious applications. Frankincense and myrrh, for example, were predominantly items of religious significance, burned in honor of the gods at temples and at funerals for centuries. Literary evidence for the use of eastern trade goods in the manufacture of medicines includes Dioscorides’ (c. 40-90 AD) De Materia Medica, which dates from approximately 65 AD and is one of the most comprehensive ancient treatises concerning the medicinal uses of many eastern trade items. Eastern goods were especially prized for their perceived properties as antidotes, which made them useful for cleansing wounds, defeating infections, and as preventives against poisoning. In his writings, Theophrastus (c. 372-288 BC), for one, noted the power of pepper as an antidote. Any discussion of Indian Ocean trade would be incomplete without the wealth of information that has been gained from archaeological excavation work; together with literary references such resources help contextualize the material carried onboard the Godavaya shipwreck. A commercial relationship between India and the western world is confirmed by abundant archaeological evidence, including excavation work carried out successively in 1945 by Mortimer Wheeler, in 1947-48 by Wheeler and J.M. Casal, and in 1989-1992 by Vimala Begley at the port of Arikamedu. Arikamedu, one of the emporia of Roman trade on India’s Coromandel Coast, has come to be regarded as essential for the study of overseas commerce with the Mediterranean world during the so-called “Indo-Roman” trade period – a term that has prompted some controversy. Indisputable evidence for commerce with the Mediterranean exists in fragments of transport amphorae, cups and plates of terra sigillata, ceramic lamps and unguentaria, blue glazed faience and glass bowls found at the site. Two-thirds of the amphora fragments found at Arikamedu during the 1941-1950 excavations come from wine jars, suggesting that wine was a principal commodity sent to India from the Mediterranean. Many of the fragments originated in Roman Greece, from the island of Kos, though fragments of Knidian and Rhodian amphorae have been found as well. Fragments of Koan amphorae, originating in Campania, have led to the suggestion that wine from Greece was later supplanted at Arikamedu by an Italian production. In addition to wine jars, fragments of Spanish jars for garum sauce and olive oil have been found as well. Sherds of terra sigillata, a slipped Roman ware, found in the 1989-92 excavations at Arikamedu and dated to the first quarter of the first century C.E., are thought to represent personal possessions, novelty items, or gifts. While typically considered part of the assemblage indicating resident foreigners, a sherd found with “megalithic” writing has caused speculation that some terra sigillata pieces were sold, bartered, or gifted to the local population. Pattanam, a site on India’s southwest coast recently identified as ancient Muziris, has also provided evidence for Indo-Roman trade; Mediterranean contact is represented by readily identifiable ceramic material, including a Dressel 2-4 amphora, as well as other finds of imported Roman amphorae and related fine wares. Such artifacts date from between the late first century B.C.E. to the fourth century C.E. Remnants of Roman glass bowls, fragments of painted glass objects, and glass pendants discovered at the site are also suggestive of personal belongings rather than merchandise. Evidence further supporting the supposition that Muziris may have had a Roman ‘merchant colony’ comes from the Tabula Peutingeriana, a medieval map depicting the Roman world as it was in the first century C.E. This map shows a building marked as "Templum Augusti" (Temple of Augustus) at Muziris. Young argues that such a structure would have been built only by subjects of the Roman Empire, likely ones who either lived in Muziris or who spent a significant portion of their time there. Young further argues that the presence of foreign merchants is supported by the Periplus, in a passage that mentions “enough grain for those concerned with shipping, because the merchants do not use it.” These merchants who do not use grain are thought to be Indians who would instead have eaten rice, whereas ‘those concerned with shipping,’ are thought to have been resident foreigners. Roman Map showing "Templum Augusti" in Muziris, southern India. 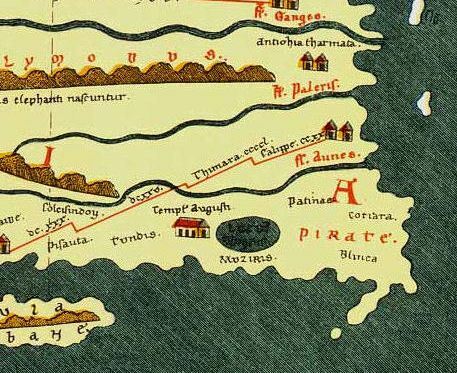 Taprobane can be seen at the bottom of this map, called "Tabula Peutingeriana"
Roman commodities also passed through Vasavasamudram, an ancient port north of Arikamedu, and Alagankulam, a port city south of Arikamedu. In northwest India, long-distance maritime connections during the last decades of the first century B.C.E. and the early years of the first century C.E. are supported by findings of Mediterranean amphora fragments found off Bet Dwarka Island. Nevasa, in western India and excavated between 1954 and 1956, and again between 1959 and 1961, offers additional evidence for commercial interaction between the Mediterranean and India. Fragments of Italian Dressel 2-4 amphorae – a distinctive ware used primarily to transport wine – dated to between 25 BC and 100 AD, and a sherd thought to belong to a late Rhodian amphora, constitute some of the best evidence the site has to offer for Mediterranean contact. In Sri Lanka, at sites such as Anuradhapura, Tissamaharama – where Roman amphorae and Islamic glazed wares have been discovered – and Mantai, there is evidence supporting Sri Lanka’s involvement in early trade networks, primarily with India. Sri Lanka’s close relationship with its northern neighbor, India, is particularly important to understanding the region’s commercial networks. The Buddhist chronicles, the Dipavamsa and Mahavansa, written in the fourth and sixth centuries, attest to the arrival of Prince Vijaya and his Sinhalese followers from northern India in the sixth century BC. Archaeologically there is much evidence to tie the two countries together. Mantai, for example, situated at the northwest tip of Sri Lanka and occupied from the fifth century B.C.E. to the 11th century C.E., represents a major point of contact between South India and Sri Lanka with excavation work supporting extensive trade. Such contact is relevant to the proposed thesis work here as the glass found onboard the Godavaya shipwreck is thought to have originated in South India. In fact, many of the artifacts found onboard the Godavaya shipwreck – ceramics, stone querns, glass ingots, and iron ingots – suggest a close association with southern India. Indo-Roman commerce is also well-represented at such sites as Berenike, on Egypt’s Red Sea coast, where fieldwork has shown that the port functioned “as a conduit for merchandise, people, and ideas passing between Egypt and the Mediterranean basin on the one hand and the Red Sea and Indian Ocean littorals on the other.” Textile finds at Berenike include pieces of a sail and rope fragments, which originated from India; such material supports ‘direct’ trade and may mean that vessels like the Godavaya ship or others like it could have sailed across the Indian Ocean to Africa or Egypt. Archaeological finds at Arikamedu and other sites verify that imported western goods were brought to India’s eastern coast as well as to its more accessible western one. These commodities may not have been transported in Roman vessels, however. Casson argues that Indian vessels rather than Mediterranean ones handled India’s east coast trade, utilizing small craft, which hugged the coastline, to shuttle back and forth between the subcontinent’s east and west ports. Shipments of goods arriving from the Mediterranean were received once a year, in ports on India’s west coast, in September or early October. These goods were then forwarded, likely by Indian merchants, to India’s east coast ports. While taking part in the trade required a formidable amount of capital in the west, there were opportunities for small-scale operators on India’s east coast. Participation in such commerce was hugely profitable to justify the risk and expense involved. The Muziris Papyrus, discovered in 1985, which constitutes part of an agreement drawn up in Muziris between a second century C.E. creditor and a merchant, underscores the enormity of the investment represented. The document concerns a shipment of goods, including nard, ivory, and textiles – items frequently found among India’s exports – and a calculation of their value. Originally thought to be the remains of a maritime loan, the document may instead represent a separate contract between the two parties concerning the security of the goods involved, drawn up once the commodities had arrived from India. Given the effort and time involved in shipping goods from India to Egypt in the second century C.E., it has been suggested that the papyrus represents a supplementary agreement meant to detail precisely the responsibilities of the borrower from the moment the shipment arrived safely at its Red Sea port. The papyrus additionally underscores the monetary investment involved in Mediterranean trade with India. Evidence for Indian merchants trading in ‘western’ ports exists in the form of little-publicized epigraphical fragments from the Red Sea port of Quseir al Qadim (Myos Hormos). Graffiti inscriptions with Tamil names in Tamil-Brahmi script as well as an ostracon with a Prakrit inscription recording the goods or personal possessions of individuals traveling or residing in Egypt indicate the presence of Tamil speakers on Egypt’s Red Sea coast. These have been dated to the second or third century C.E. Such documents, though fragmentary, help corroborate and personalize the corpus of Greco-Roman sources concerning the flourishing trade between India and the Roman Empire. Non Roman pottery sherds found at Khor Rori in Oman and at Berenike in Roman Egypt may also be indicative of active participation by Indian or other easterners in the Mediterranean; such evidence contests arguments against the direct participation of South Indian merchants in overseas commerce. Some ancient merchants may have traveled as far as China in search of profitable commerce. Given that the voyage to India was relatively commonplace in the first century C.E., it seems more than plausible that a few sailed further east. This is supported by chinese court recods that detail visit by Roman traders to Southeast Asia and China. The most famous of these accounts is found in the Hou Han-Shou, or Annals of the Later Han Dynasty, a far eastern source compiled in the fifth century C.E. by Fan Yeh of the Sung Dynasty (420-477 C.E.). These annals, which cover the period between 23 C.E. and 220 C.E., record that in 166 C.E. an embassy from king An-tun from Ta-chʻin (alternately Ta-ts’in) arrived from Annam (Vietnam) and sent gifts of ivory, rhinoceros horn, and tortoiseshell to the Han court. Ta-chʻin, or Ta-ts’in, has been identified by Friedrich Hirth as the Chinese name for the Roman East and An-tun as the Chinese rendering of Antonius. Ferguson additionally comments that the term Ta-ts’in was generally applied to mean those from the Mediterranean and underscores this as applicable to the Seleucid kingdom, to Nabataean traders, to the Egyptian empire of Alexandria, and to Rome and its domain. Romans also reached southern Japan (Okinawa)....but what about northern Australia?